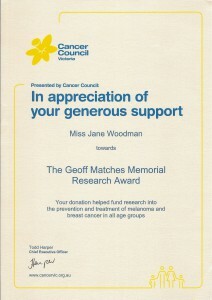 I am proud to announce the establishment of the Geoff Matches Memorial Research Award! A massive THANK YOU to all those who gave so generously. 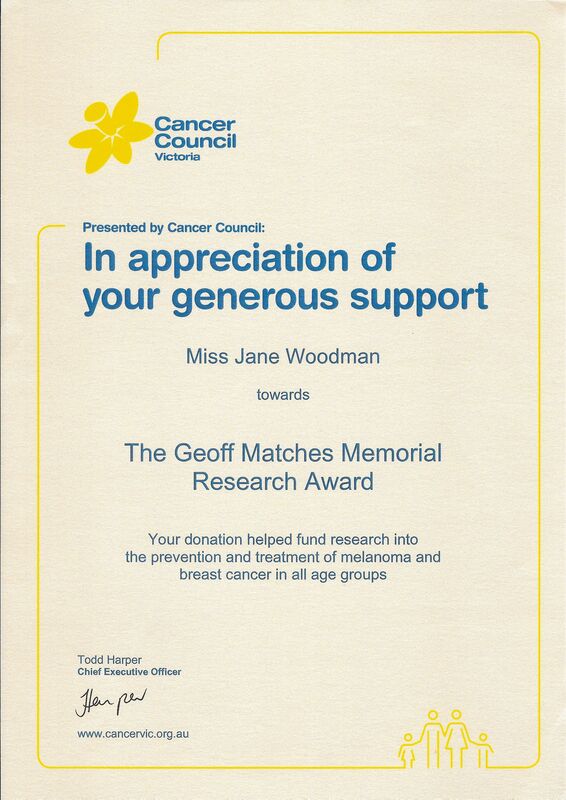 The money raised is being used by Dr Nicole Haynes from the University of Melbourne, who is researching the prevention and treatment of melanoma and breast cancer in all age groups. It’s a fabulous result, and I’m very proud that we have been able to contribute so significantly to such a worthy cause. Good luck with everything MPL! Hope you are enjoying your trip, Jane. Dali isn’t the same without you. Well, anyway, we will celebrate it tonight here in Jade Emu ! What a wonderful adventure you are having!I am enjoying your travel log and photoes. Keep safe.Aunty Marg. I love reading your tales Jane. Though they fill me with envy and frustration that I am stuck in London, England for a while (being boring for a couple of years whilst I sort out my finances). So your amazing journey provides much needed inspiration and positivity. Slow down though, or you’ll arrive at the end and have to turn around and go back to lovely Dali. Great to meet you and your Dad Jane, and to hear about your adventure thus far. We pray that you stay safe and that there are many, many more cycle tours ahead of you. Kindest Regards Greg & Wendy. We meet you today at the rest stop near Raymond Terrace. Congratulations on your epic journey. We were already impressed when we misread Beijing as brisbane on your number plate!!! China to Oz is a great achievement and for such a worthy cause. We enjoyed meeting Tarquin and Patsy and we hope a cuddle from baby Robin has supplied you some good mental energy for when you battle the head winds and hills today! A real pleasure to meet up with you at Windang Tourist Park. Thanks for the interesting chats around the BBQ over the past 2 nights. Hope the rest of your journey is enjoyable and successful. Keep up the good work for a worthwhile cause! We met you at the Cann River Caravan Park where you were enjoying a ‘rest day’. Mum and I were thinking of you and your epic journey all the way to Melbourne. We hope your remaining journey goes without hitch and that you are welcomed in Melbourne by a host of well-wishers and supporters. You have achieved a marvellous goal and you are an inspiration to all. Well done. Hope to see you when you arrive in Melbourne!! Regards and best wishes, Carole, Rene and Kahli (the german shepherd). Congratulations Jane on completing your journey! Hope you had a good crowd at fed square, sorry we didn’t make it Jane and Andrew (cann river) . Loved your interview on Jon Faine Jane, well done!! Great to hear you on the Faine show. Like Todd said, well done.